House Sharing Tips Part 7: sharing a mortgage and a house to access the property ladder is undoubtedly taking a positive step in life: it is your investment into a brighter future; having aspirations and dreams which you work hard to achieve is pure creativity and finding a house sharer who also has this ethos is also desirable. Any house share will benefit from sharers having a positive, creative attitude but the idea of being prepared to share to enhance your life will happily tend to attract these kinds of people. You can secure matters further by having a well-thought-out legally-binding agreement in place to protect everyone's share and set down strategies to deal with unexpected events. Find out more about legally-binding house sharing agreements - call 0207 112 5388. 'Creative'? Is that another word for 'out there'?! A person on average income in the UK today, £26,000 per year, has to be creative in their approach if they want to access the UK housing ladder, unless they have recourse to gifted or loaned money from friends or family. Potential sharers will vary in terms of what they can add to the resource pool. Some may have deposit funds, some may have reasonable incomes, some may have both and some may have very little but have other strengths. Once again, what remains important is their positivity of outlook, their trustworthiness and their wish to 'get on'. Increasingly it looks as though the main parties will rely on alliances with smaller parties if they want to take over 10 Downing Street. They will have to be creative in their offerings and overtures to these and in turn, smaller parties have much to gain if they are equally creative and attractive-seeming when it comes to bargaining! 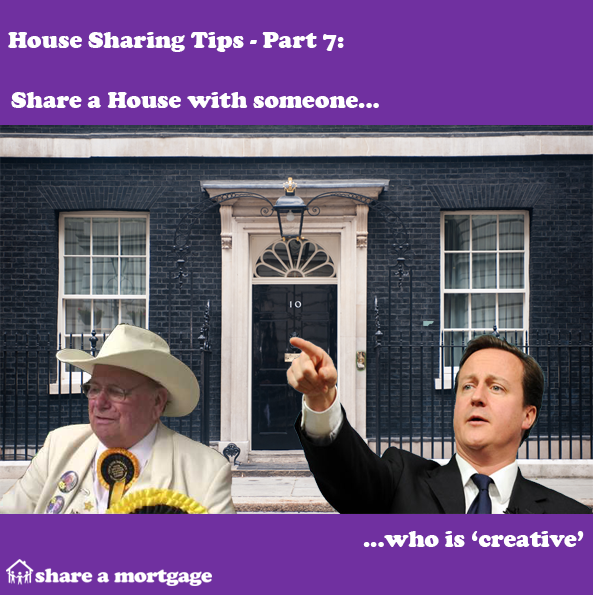 How can I ensure a sharer's commitment to the kind of house share I'd like? Nothing comes with a cast-iron guarantee in life, but beyond careful planning and conversation. you can draw up a formal, legally-binding agreement protects everyone's individual ownership in a share while establishing procedures to deal with unexpected events. You'll all want to know how much of a house share you actually own at any point and you'll want to decide how, for example, people can exit if they need to or any house rules you can all agree on. Share a Mortgage's Shared Ownership Protection covers all these matters and more and each agreement is bespoke for your individual house share. Email us at help@shareamortgage.com with any queries about house sharing arrangements and how they can help you establish a productive house share.